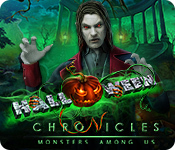 Halloween Chronicles: Monsters Among Us is rated 4.0 out of 5 by 2. Rated 5 out of 5 by biscuitsmama from MY FAVORITE TYPE OF HALLOWEEN GAME It looks like BFG has gone all out this year with Halloween games and then some. Almost every game since September has been devoted to some sort of horror; as well as monsters and ghouls of one sort or another. Domini has jumped into the arena with Halloween Chronicles Monsters Among Us and it is a Halloween delight. For those of you who love this time of year and all that it has to offer, you will probably like this game. Even with Halloween not being my favorite event, I am enjoying Halloween Chronicles. Although I find the game is rather slow in the beginning, I do enjoy the HOPS and Puzzles a lot. The only things that I dislike in the game are the very slow beginning and the unrealistic color palette that Domini has once again chosen for a game. That being said I like the graphics in this game far more than those in other recent games from Domini. Domini has created some wonderful HOPS that include a slider type scene that I haven’t seen in ages. Most of the HOPS are very well-designed and blend into the storyline which increased the fun I am having as I play through this entertaining and long game. 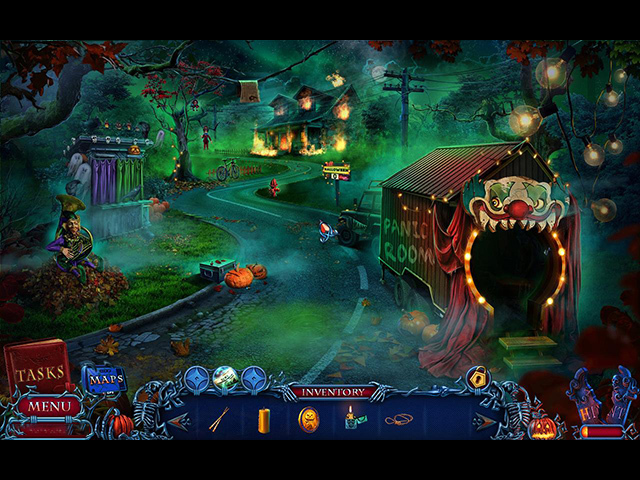 There is not a lot to say about the Puzzles in Halloween Chronicles except that all of them are excellent. What I appreciate is that we do have a choice of selecting whether we would like “Easy or Hard Puzzles” when we set up the game but you can change your selection as you encounter each puzzles. I normally select the “Hard” setting but I did change that to “Easy” once or twice when I didn’t want to spend a lot of time solving the puzzle in the more difficult setting. This is such a fun game and, at least to me, it is one of the best games during the fall season. Even though it is full of monsters of one sort or another, I didn’t find any of them to be too gross or even frightening. This is my type of Halloween game and it was more fun since I didn’t feel like I was running for my life as I played the game. Even though this Halloween Chronicle is the perfect game for me, please try the demo to see if it is just right for you. Happy gaming! Rated 3 out of 5 by pennmom36 from HOPE YOU DON'T HAVE PEDIOPHOBIA OR COULROPHOBIA Halloween is quickly approaching, and so are the monsters who anxiously await All Hallows Eve! Riverstown, Virginia will never be the same once the Master has been released to walk amongst the living. All hope is not lost yet! You may have been sheltered from the dangerous truth for most of your childhood, sheltered from learning the true identity of your parents, but now that the truth has been revealed, it's time to follow in your family's footsteps. It's time to hunt down the Monsters Among Us! Good news! The overabundance of Blurple colors has not been used in Domini's newest series Halloween Chronicles! The bad news is that Blurple has been swapped with Neon Green, but at least I didn't lose my diary/journal note to a random gust of wind! More good news, I'm not carrying around a large paper map because I have a phone! More bad news, there's no need for magic glasses, but there is a need for a magic camera, does everything have to center around magic items my little origami puppy? This is a very long game, another feature Domini is famous for, but for me personally, it's a little too stretched out. I find the added filler tasks to become tedious because they don't add anything to the storyline. The tasks are just added to make the game longer but at the same time, it can become boring when you're just doing the same thing over and over. If this game were a little creepier, less neonish in color, and more condensed, it would be a 5-star game in my eyes. 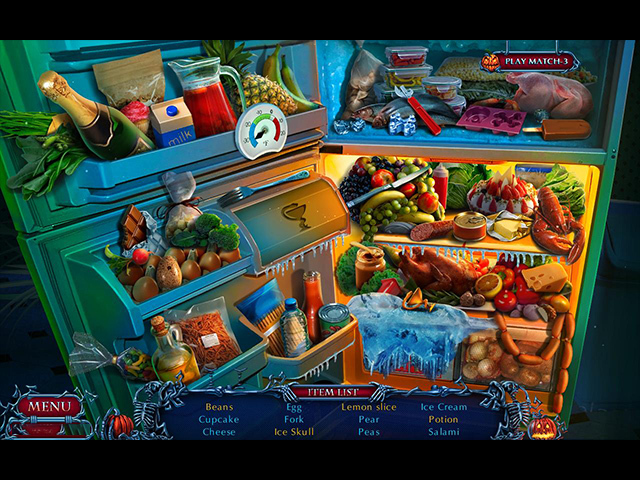 The Hidden Object Scenes are mostly variations of Keywords in Sentence finds as Silhouetted Shape finds, Listed Item finds, Multiple Item finds, and Combination Silhouetted Shape finds (the product of 2 items combined) There are several Zoom Zone Hidden Object Scenes available that usually require finding 6 or more objects shown as Silhouetted Shapes. There is an alternate Match 3 game available and there is an achievement for playing a Match 3 game instead of the HOP. The Mini-Games are fairly creative and I haven't come across a lot of my nemesis puzzles where "selecting one may affect others" which this dev is famous for at times, so I appreciate that immensely. In the Custom Mode Difficulty setting, you can opt to have the Mini-Games start out in an Easy or Hard difficulty mode, however, you can always select the opposite for each one, once they pop-up. I love this feature, I always start out in the Hard Mode, and if it's mind-boggling, I simply switch to the Easy mode (the hard mode usually involves my aforementioned nemesis style) Below are brief descriptions of some of the games (describing the easy mode instructions) that you'll encounter during the demo as well as shortly after: 1-Place gears in a watch correctly (w/in HOP) 2-Click partial images to replicate the spider as shown on the clue. 3-Rotate tokens to complete the path of blood flow. 4-Use directional arrows to repeat the eye movement x3. 5-Select the exact match for each highlighted token. 6-Swap symbols to match the symbols on trace paper. 7-Position the skeleton's limbs & head to match the position shown. 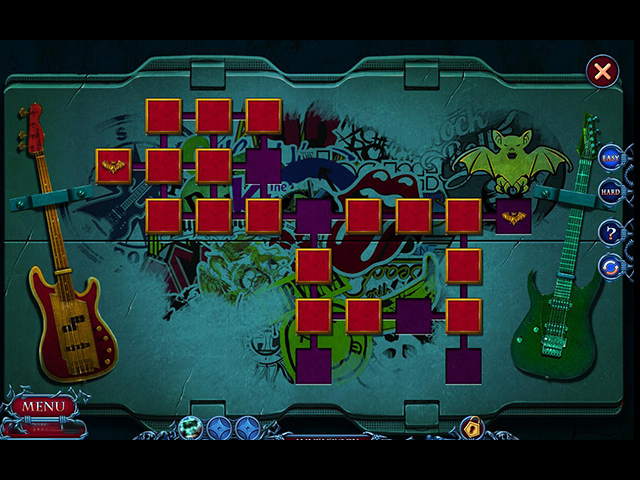 8-Memorize & select the Crossbow card to attack & the Shield card to defend. 9-Choose from 3 paths at the correct time to avoid the sirens. 10-Play poker with skeletons by completing the pattern x3. 11-Use directional arrows to rotate tokens to the correct slots. 12-Swap pyramid sections to stack correctly onto the middle post. 13-Rotate arrow to the correct numbers, the Triangle & Square adjust the # of spaces the arrow moves. The Collector's Edition version has 14 Wallpapers, 15 Concept Art pictures, 29 Movie Cutscene Videos, 5 Music Soundtracks, 22 re-playable Mini-Games, 18 re-playable Hidden Object Scenes, 33 Achievements to earn, 15 Collectible Monster Pictures,15 Collectible Newspaper Article Interviews, 71 Hidden Film Rolls to buy 15 Boudoir Items, (note: you can disable Icon Alerts for the collectibles in the Custom Settings) 4 Main Chapters +Bonus Chapter (very long chapters, extremely long BC) Enjoy the Halloween Hunt!